By now it is a truism that Shakespeare’s plays explore universal themes, but the Globe has taken this idea further than most. From its riverside base in London, the theatre has increasingly attempted to live up to its name and showcase Shakespeare’s work on an international level, both by touring its own productions and bringing in companies from around the world. The pinnacle of the theatre’s international ambition to date was the 2012 Globe to Globe Festival, which invited productions of all 37 of Shakespeare’s plays in different languages, performed by companies from all over the world. Festival director Tom Bird describes the feat as a “huge, ambitious and difficult thing to pull off”. The first challenge was to decide which countries and languages to include, which Bird and his team tackled by choosing to focus first and foremost on communities living in London. The other starting point was the desire to make the programme as varied as possible – “we always wanted to mix it up”. The resulting festival attracted a diverse range of audiences, made up of regular visitors to the Globe and a huge influx of new theatregoers who came to see Shakespeare performed in their native languages. Bird quotes the astonishing figure that 81% of Globe to Globe audiences had never been to the Globe before, far exceeding the festival’s targets. The programme also “confounded expectations of what we think we can do with those plays”. Following the festival’s success, the Globe has made a commitment to continuing this international strand and is once again bringing back three Globe to Globe companies this year: Indian company Arpana, Fundación Siglo de Oro from Spain, and Deafinitely Theatre, whose work uses British Sign Language. 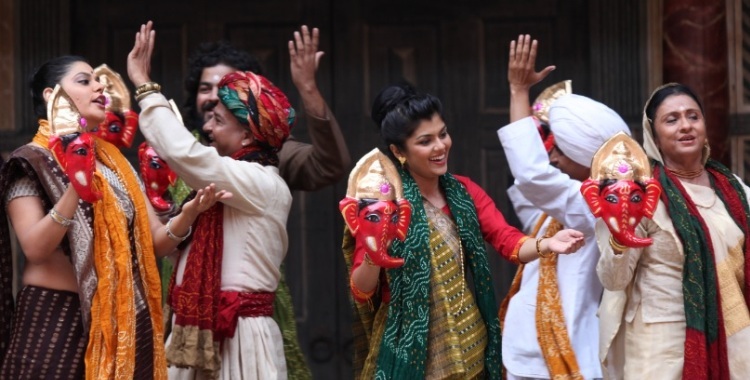 Sunil Shanbag of Arpana, who will be bringing back their Gujarati version of All’s Well That Ends Well, describes the chance to perform at the Globe as a “once in a lifetime opportunity” – or twice in a lifetime, in their case. For Shanbag, the priority was to make the play work for Gujarati audiences, but he has been overwhelmed by the response beyond the Gujarati community, especially from Shakespearean academics. He suggests that Arpana’s version, which drew on popular street theatre aesthetics, worked because “the very powerful emotions that run through Shakespeare’s plays – of love, hate, betrayal, loss – these are elements that are very similar to the elements that you find in Indian storytelling”. Similarly, Fundación Siglo de Oro’s Rodrigo Arribas notes similarities between Shakespeare’s plays and the theatre of Spain’s Golden Age. After presenting Henry VIII in 2012, this year the company are performing Lope de Vega’s Punishment Without Revenge, which Arribas says shares Shakespeare’s “profound capacity for dissecting the psycho-emotional nature of human beings with their desires, ambitions, perversions, doubts”. The company have found that the festival had a positive impact on their audiences, continuing their project of bridging the gap between deaf and hearing theatregoers. They hope to continue this with their new version of A Midsummer Night’s Dream this year, which has been chosen to be as accessible as possible. Never shy of a challenge, the Globe’s latest international project involves touring Hamlet to every country in the world over the next two years, coinciding with the anniversaries of Shakespeare’s birth and death. Explaining the impetus, Bird says, “we wanted another huge ambitious project to really get our teeth into and to reflect the relationships we had all around the world”. The project recently received criticism from Amnesty International for its decision to visit North Korea as part of the tour, but Bird insists that “every single country means every single country”. He explains, “we want to be inclusive and not exclusive and to have conversations with as many people as possible”.